The study defines a methodology for monitoring the implementation of the Directive, and gathers data to assess its current status of implementation and any change in the outcomes since its application date in July 2016. It also identifies best practice examples of access and co-deployment regimes as well as standards for in-building infrastructure, based on case studies and interviews. As little time has passed since the Directive’s transposition into national law by Member States, no definitive conclusions can yet be drawn concerning the overall impact of the Directive on reducing the cost of broadband deployment or achieving more ambitious targets in line with the Gigabit society. 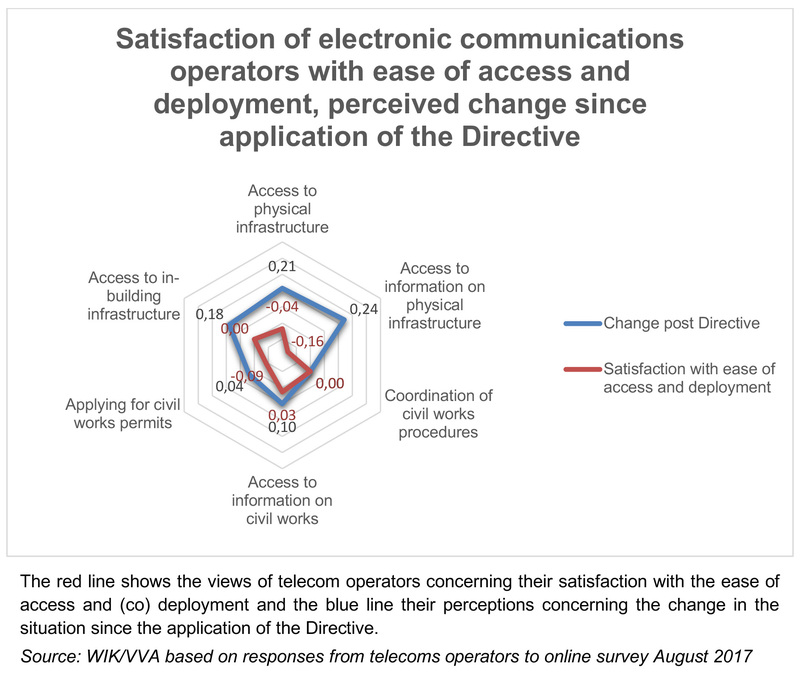 Survey responses show that electronic communications operators believe that there have been improvements in access to physical (including in-building) infrastructure and the information relating to them since the Directive was applied. However, there is still room for improvement, with operators indicating that limited progress has been made in supporting the coordination of civil works, easing the process of applying for civil works permits, or facilitating access to buildings for the installation of in-building infrastructure. Evidence from countries which previously applied provisions similar to those in the Directive, indicate that cross-sectoral collaboration can enable significant cost reductions, supporting the more widespread deployment of high and very high capacity broadband. The study suggests that cost savings in the order of 40-50% could be gained by sharing infrastructure or coordinating civil works. The degree of cost reduction possible by making use of access to existing infrastructure, as well as the potential for pole access to facilitate rural deployment both illustrate the role the Directive could play in supporting the objectives outlined in the Communication on Connectivity for a Gigabit Society. Achieving these benefits may however require a more pro-active approach of Member States to implementing the provisions of the Directive, potentially including those which are presented as optional. Furthermore, additional data should be gathered by competent authorities on key performance indicators to enable a continuous monitoring and a future evaluation of the Directive. The study results fed into the Commission's report to the European Parliament and Council on the implementation of the Directive.